With her employer’s journalistic reputation on the line, New York Times journalist Sabrina Tavernise researched and wrote an article blaming America’s gun culture for the majority of suicides in the United States. Using classic combination of anecdotes, testimonials, hand-picked statistics, Tavernise presented her case to her American readers, hoping, perhaps even praying, no one would check her work. Sorry, Sabrina, you’re busted. Tavernise tells a truly heart-wrenching story of a father who found his son dead on the floor, cradling his great-uncle’s pistol. She then presents some suicide facts. In 2010 nearly 20,000 despondent Americans died from self-inflicted gunshots and over 10,000 Americans were murdered with a firearm. In America, these numbers dwarf all other means of suicide and murder. It is a natural gut reaction to blame the method (guns) for the problem (suicide and murder), and Tavernise has unconditionally thrown her lot in with that camp. Before we follow Tavernise’s lead, let’s back up a step or two and look at the world stage. 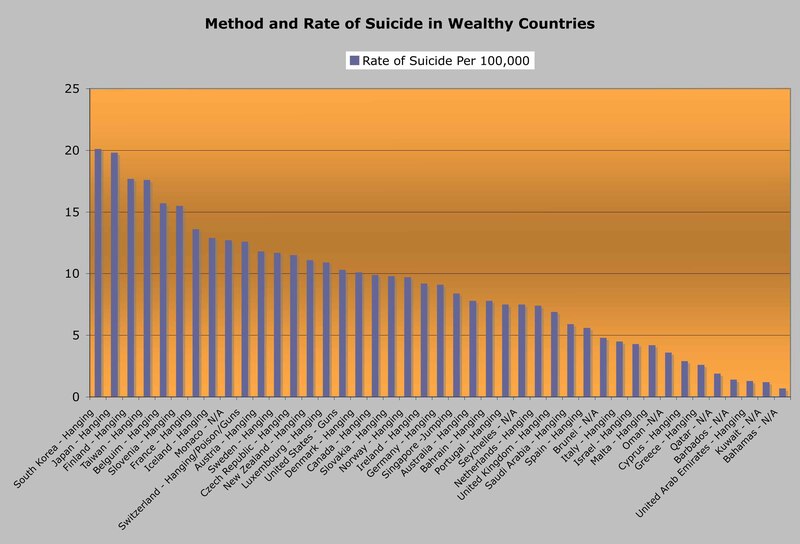 The global average suicide rate for all countries is about 9.5 deaths per 100,000 in population, the average rate among countries with a per capita GDP above $23,000 is about 8.9, and the U.S. is about 10.3. Globally, self-strangulation by hanging is far-and-away the most popular means of successful suicide. America is the only country where guns dominate suicide statistics. According to the World Health Organization (World Report on Violence and Health, pg 196) the method chosen for suicide is simply a gauge of determination. Hanging, jumping, and firearms are the quickest, most effective methods. If someone is really bent on suicide they will pick one of these three. 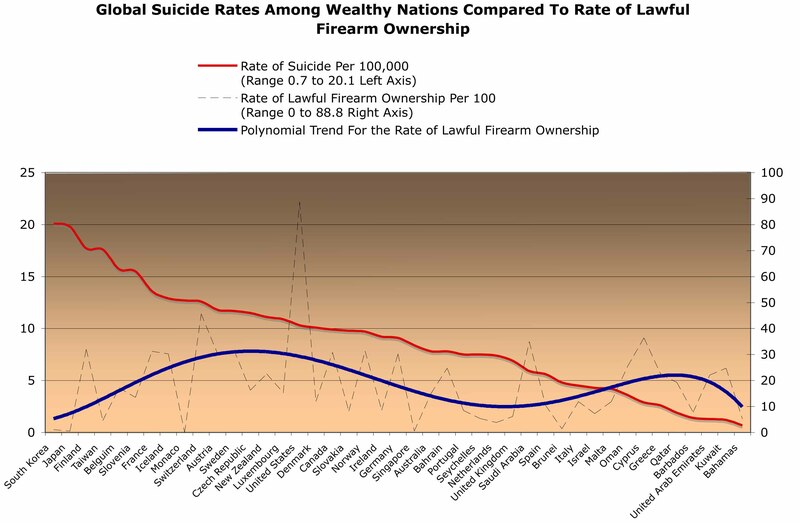 Japan, South Korea, Taiwan, and Monaco all have suicide rates well above the U.S., yet private ownership of firearms is virtually banned in those countries. This theory that Tavernise is promoting, that firearms literally sing a Siren’s song to despondent Americans telling them to kill themselves, is nothing more than a crafty bit of mythology. If we manage to take away guns from the suicidal, they will just go and purchase a good piece of rope. 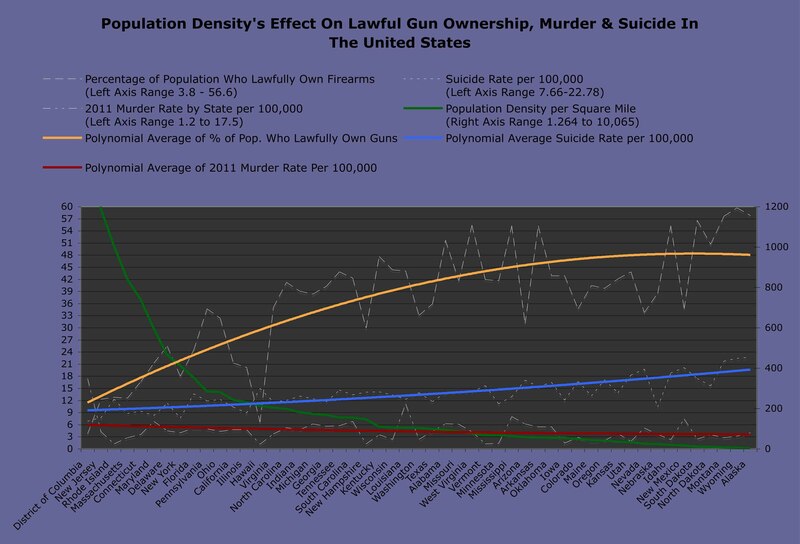 Tavernise cleverly links rates of gun ownership in the U.S. to rates of suicide. Coincidentally, Alaska, Wyoming, and Montana have both the nation’s highest firearm ownerships rates and the nation’s highest suicide rates. This trend generally holds true for all fifty states and Washington D.C. Superficially, it looks like a done deal. People plus guns equals suicides. Tavernise seals the deal with some expert testimony from epidemiologist, Dr. Mark Rosenberg, who expertly concludes that guns are like time-bombs in the home. Before we take them at their word, we need to look deeper at other factors in the data. First, Tavernise omits the fact, that while suicide rates rise as gun ownership rises, murder rates actually fall. Washington D.C. owns both the nation’s lowest gun ownership rate and highest murder rate. Next, according to the World Health Organization (World Report on Violence and Health, pg 196), global suicide rates tend to rise as population density decreases. They attribute this to the social isolation, lower education levels, and limited medical care that are endemic to rural areas. If we apply this theory to population densities in the U.S. it holds water. Alaska has only one person per square mile. Washington D.C. has over 10,000 per square mile. As population density increases, suicide rates decrease. Suddenly we have an alternate data set that confounds Taverinse’s conclusion. So which is right? Here is my argument that it is isolation, not firearms, that leads to despair and suicide. First, it makes good, clinical sense. Second, one of the biggest reasons Americans who live in rural areas have guns is for recreational purposes. 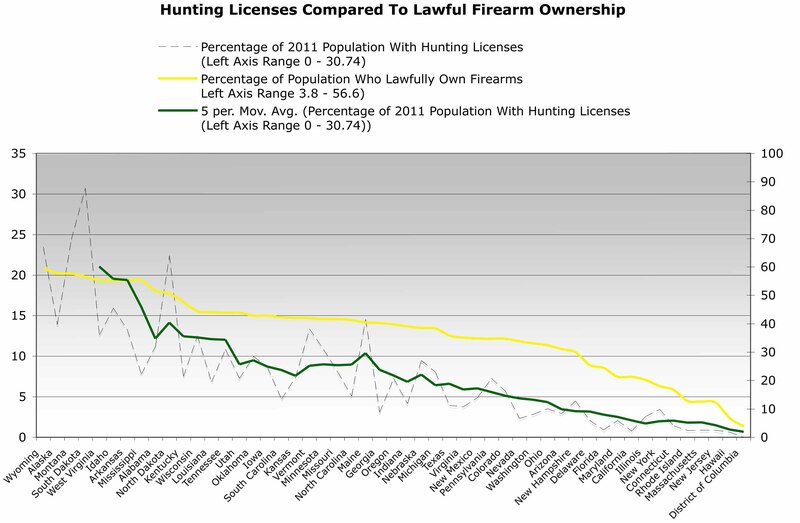 There is a direct correlation between a state’s rate of private gun ownership and the number of hunting licenses issued. It is not that people who like guns are more prone to suicide. Rather, people who like guns usually like to hunt. Alaska, Montana and Wyoming are the wonderlands of the outdoorsmen. There ain’t nothin’ to hunt in D.C. According to Tavernise, if we could only block access to guns, get rid of them, we could dramatically reduce suicide and murder. It is a tempting piece of fruit, this simple theory. Gut the Second Amendment in exchange for up to 30,000 lives saved each year. If only the gun nuts could put aside their wrongheaded ways and come to the table to discuss the problem. Unfortunately, as another Tavernise expert, suicide prevention specialist B.J. Ayers, puts it, gun owners are just too defensive and refuse to listen to reason… and it is costing tens of thousands of Americans lives every year! But is it? Let’s examine Tavernise’s utopia where law-abiding citizens voluntarily give up all of their firearms on the promise it will save lives. I realize it is an impossible scenario, but let’s examine it anyway. Further, in our impossible scenario, I will allow that 100% of suicides and 100% of murders that involve a lawfully owned firearm will be prevented and nearly 30,000 American lives will be saved. There is a statistical category of gun use called ‘Defensive Gun Use’ or DGU. DGU occurs when a law-abiding citizen uses his or her lawfully owned firearm to defend him or herself against a criminal. In most cases of DGU the weapon is not fired, for its mere presence dissuades the criminal and causes them to flee. Sometimes, however, the criminal ends up at the morgue with a toe-tag. Although there are no accurate statistics on DGU, even Harvard University’s David Hemenway, a man who considers violence a disease and firearms the contagion, admits that Americans use firearms to lawfully defend themselves a minimum of 100,000 times a year. Florida State University criminologist, Gary Kleck, who Tavernise also uses as an expert source, published a study on DGU that concluded that guns are used defensively up to 2.5 million times a year in the United States. Let’s say, for the sake of argument, that in 5% of DGU cases, the citizen prevents their own murder. That means by giving up all of our guns, somewhere between 5,000 and 125,000 Americans will get murdered every year by criminals who will never, ever give up their guns peacefully. At best we would be killing Peter to save Paul. At worst Peter and Paul are both dead and the bad guy is coming for us next. Who won’t come to the table and listen to reason now? What do Alaska, Russia, the Northwest Territories, the Yukon, and Finland all have in common? If you said high suicide rates, you’d be right. Do you know what else? The 66th Parallel runs right through the middle of each one of them. Not enough sun in the winter and too much sun in the summer. This is just another factor Tavernise conveniently did not take into account when attacking Alaska’s gun owners. It is as though, in Tavernise’s world, social isolation and seasonal affective disorder have absolutely nothing to do with depression. I can’t believe she is still employed. Within the United States, people in rural areas hunt, fish and own guns. They also have less education, less access to medical care and suffer from social isolation. 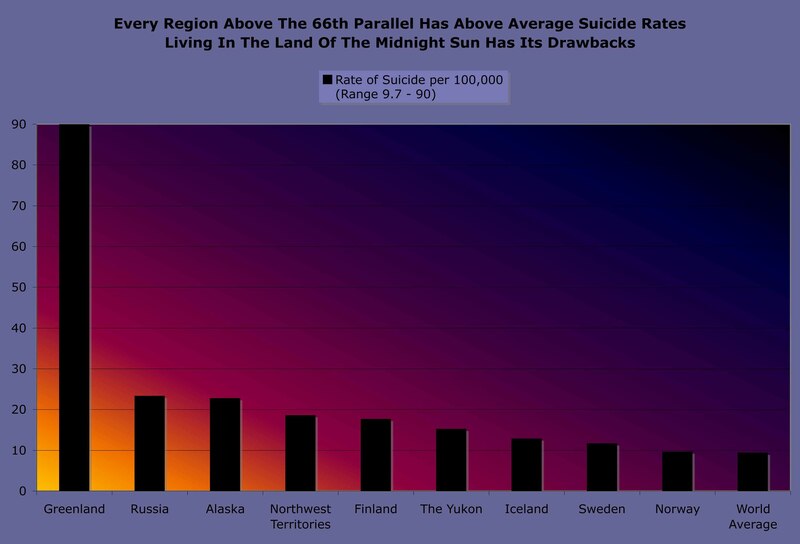 They commit suicide at a higher rate than those in urban areas. People living in urban areas own far fewer guns, are less likely to be sportsmen, but suffer from social crowding. They engage in violent crimes at a higher rate than those living in rural areas. 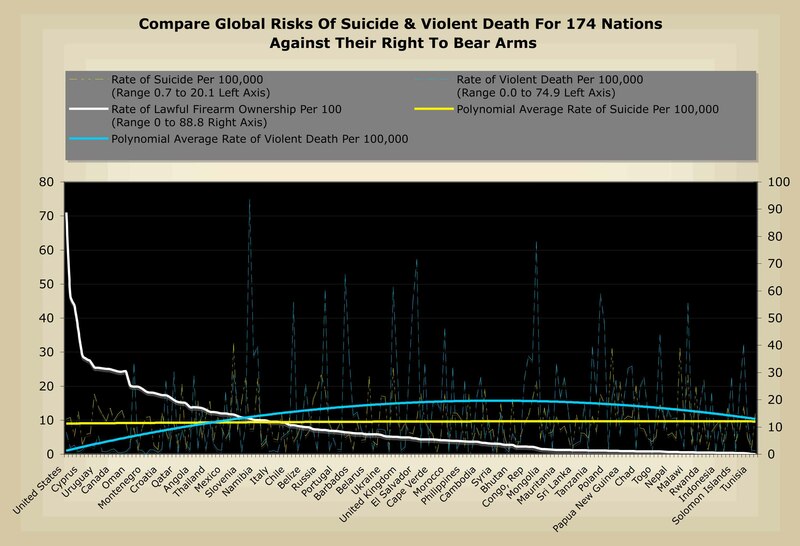 Globally, nations where citizens have the right to bear arms are at a slightly lower risk for suicide and a much lower risk for a violent death than those nations where firearms are not readily available to law-abiding citizens. When journalists, such as Sabrina Tavernise, deny these facts in favor of their personal agenda, they not only destroy their reputation, they do extreme harm to our country. I am not an expert when it comes to suicide and murder, but being human and in healthcare, I have an empathetic sense for the human condition. People often dislike being alone, yet can become equally frustrated being around their fellow man. Placing the blame on inanimate objects, such as guns, knives, rope, tall buildings, household poisons, etc., for the nature of the human condition is not rational thinking. Violence and suicide existed before firearms. Violence and suicide existed before swords. Violence and suicide are simply a sad part of human nature, and something every man, woman, and child in all of history has struggled with. Everyone gets angry from time to time. Everyone experiences despair. A few of us are quite mad. We kill each other and we kill ourselves. We always have and we always will, guns or no guns.